Experience luxury at its finest in this beautiful 6-bedroom, 6-bathroom luxury home on Peak 8 in Breckenridge. No expense was spared in making Christie Heights Imperial Lodge the ultimate getaway for families and large groups of up to 18 people! This home’s location on Peak 8 — in one of Breckenridge’s premier neighborhoods — offers privacy and convenience. 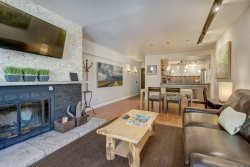 You’re just a two-hundred yard stroll to free town shuttles that will whisk you to the slopes or to all the fine dining, shops and nightlife of downtown Breckenridge. And, the house is adjacent to the Nordic Center for easy access to cross-country ski trails, as well as plentiful summer hiking trails. As you enter this grand mountain home, you’ll notice the floor-to-ceiling windows that flood the main living area with light and offer spectacular mountain vistas. There is plenty of seating next to the massive rock fireplace and large LCD TV for entertainment. Next, check out the kitchen: Viking gas range and refrigerator, double Jenn-Air ovens, huge marble counters and stunning cabinetry. There’s even a built-in wine cooler for your favorite vintages! The long dining table seats 10 comfortably, and there’s room for five at the counter. Descend the stairs to the lower level and prepare to be just as impressed. There’s a second kitchen area and large refrigerator, a wine cooler and rack, plus bar-like seating at a long stone island. Another den/seating area invites with a second fireplace and LCD TV/entertainment system. Shoot a game of pool, then walk out the sliding glass doors onto the lower level patio and sink into a large hot tub surrounded by mountain pines. Of course, there’s every other quality amenity: cable TV and complimentary Wi-Fi throughout the home, a gas grill, a washer & dryer, and a heated two-car garage with extra parking in the driveway. The list goes on! The home has an excellent central location. It is just one mile from the BreckConnect Gondola and Main St. in downtown Breckenridge. It is just under a mile from the base areas of Peaks 7 and 8. It is also less than one block walking to the Breck FreeRide shuttle stop for the Black Route (Nordic Center stop). Master suite: king bed, luxurious private bathroom with a jetted soaking tub and walk-in tile shower, huge walk-in closet, private patio entrance, LCD TV and fireplace. Queen suite: queen bed, private patio entrance, fireplace, private bath with tile tub/shower. Bunk bedroom: two captain’s bunk beds (double lower, twin upper). Master suite 2: king bed, luxurious in-suite bathroom with a jetted soaking tub and walk-in tile shower, huge walk-in closet, private patio entrance, LCD TV and fireplace. Queen suite 2: queen bed, private patio entrance, fireplace, private bath with tile tub/shower. Bunk bedroom 2: two twin bunk beds. Parking for four vehicles parked in tandem in driveway. Parking on the street will result in towing. The garage has built-in accommodations for storage of ski equipment, meaning vehicles cannot be parked inside the garage.